Fifties Connect is a great place to narrow down your search to the more mature singles you are looking for. With easy to use navigation tools, an in-depth search tool which includes filters to help you find your ideal match, and great added extras to make the whole experience a lot of fun, it’s an obvious choice in online dating for the 50+ market, whether you are looking for friendship and fun or a longer term commitment. From the moment you arrive on the Fifties Connect sign up page, simplicity is key. Simply enter a few basic details about yourself such as your gender and date of birth, enter a valid email address and pick a password, and you're good to go! At this point you will be prompted to begin building your profile. While you can skip as many steps as you want, it makes sense to be thorough at this point, the same way as you would when preparing to meet people offline! Add a few photos, include some detailed information about what you are interested in and what you are looking for. The website allows you to answer some open ended questions if you aren’t sure where to begin, and then has a more general "describe yourself" section once you are feeling more confident. Innovatively, Fifties Connect also supports a video profile. You won’t even need to verify your email account in order to start browsing singles, directly from the home page. If you know exactly what you’re looking for, use the in-depth search tools to narrow down the hunt by filters, which you will see are broadly the same as the information in your own profile. You can also search by age, location, or who is currently online. Everything is given in step by step instructions and couldn’t be easier to follow. Of course, some people don't have the time to search through hundreds of user profiles in the hope of finding someone compatible, or aren't exactly sure what to search for in the first place. The "looking for" section of your profile should help you get started. Take some time to think about what you want in a match and fill this in accordingly. Now Fifties Connect has a much better chance of matching you with someone you are interested in, and you can head to the Encounters tab, or the "recommended" section of the search feature to see how close they got it! 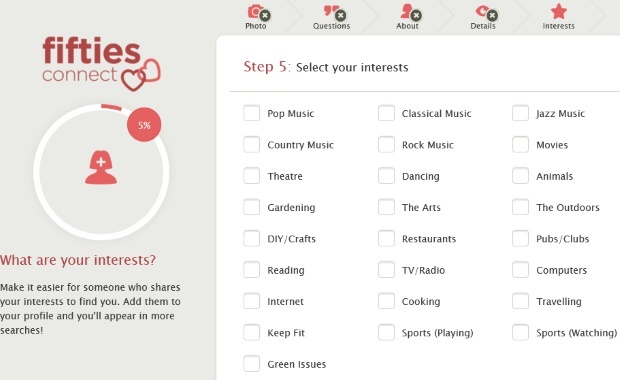 Here you will be suggested likely matches, taking all the hard work out of online dating. See someone who you want to talk to? If you’re feeling shy you can send a standard introduction or a online gift or flirt to test the waters, or if you’re the more confident type, go straight to an inbox message or even an instant message if they are currently online. Remember, Bolt-on extras can be purchased to get even more out of your communications with other users. Great added features we love are the fun and addictive 'dating diaries' where you can read about other people’s online dating journeys, or even start your own blog to share your story! We also love the new "spotlight" feature where you can highlight your profile, appearing far more often in other user searches. If you're new to online dating, and feeling worried about the anonymity of the internet, you can rest assured with the security of Online Dating Protector, a UK based team of moderators who are monitoring all suspicious or malicious activity, and scanning every profile. They are on hand via live chat to address any concerns or worries you have. Additionally, Fifties Connect provide safety tips, not only for keeping your identity and data safe online, but also for meeting safely when you're ready to move offline. Take some time to read this important advice, found at the bottom of every page. Some online dating websites offer confusing staggered price packages which offer differing levels of functionality on the site. This is definitely not the case with Fifties Connect. 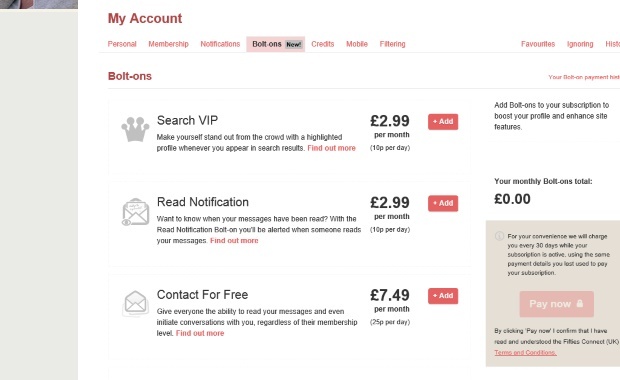 The prices change only dependant on how long a subscription you sign up for, and even the 3 day trial opens up every feature of the website, allowing you to see everything for £4.99 before you commit to longer. Once you’re sure they are the right choice for you, you will save money by committing to a longer term subscription. For example, while 1 month might seem expensive at a £29.95 cost, this drops to £19.99 per month for 3 months, and then again to £15.00/ month for 6 months. The cheapest option is a year’s subscription, which is £12.50 per month, making it only 42p per day. An online community for singles over fifty looking for fun and romance online, with easy to use search functionality. They offer a lot of great added extras for the confidence of getting to know members better before moving offline.